In the beginning of Iron Man 3 (2013), Tony injects something into his forearm. He then attempts to get his suit to come to him. After it fails, he licks his arm, rubs it and tries again, at which time it works. Is it ever explained, either in the movie or the comic book source, what he's injecting, and why he needed to rub it to get it to work? Iron Man is constantly tinkering, and each suit evolution gets a new name - Mark 1 was built in the cave in the mountains, Mark 2 was built in his lab and has tech to deal with the icing problem etc. In this scene, he is developing the Mark 42 suit (https://ironman.fandom.com/wiki/Mark_42). 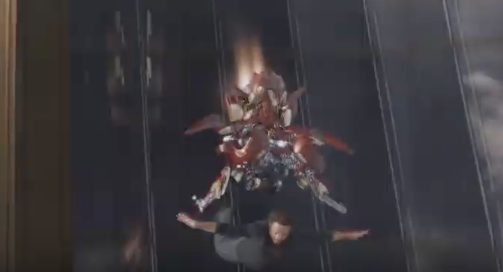 The suit can arrive in multiple pieces that can slot on individually, "tuned" to Tony, and even obey remote commands originating from Tony, and from great ranges - beyond just an AI being controlled by Jarvis. The injections he is putting into himself seem to be part of that tech. It's either a substance or a chip that is being injected into his forearm, to interface with his body - likely a neural interface. His initial gesture/command does not work as expected. After tapping/awakening his arm, it does work. This could be a direct result on the substance/chip itself, in the same vein as slapping a TV to get it to work, or slapping his forearm, designed to stimulate neural activity. When he is asleep, and having nightmares about New York, he manages to "call" to the suit in his sleep - a direct connection to his brain activity. The suit similarly "called" when he is imprisoned, from across the country. In almost all of these instances, we are visibly shown a physical gesture (the sleep one not so much, but we are cutting in and out of flashback). Tony: I'll be damned. The prodigal son returns. The Mark 42 also features the unique ability to control itself when Tony Stark isn't inside his suit or when Mark 42 is A.I-deactivated. The Subcutaneous Implant in Tony's forearms allow the armor to communicate with his nervous system helping the armor follow his commands. 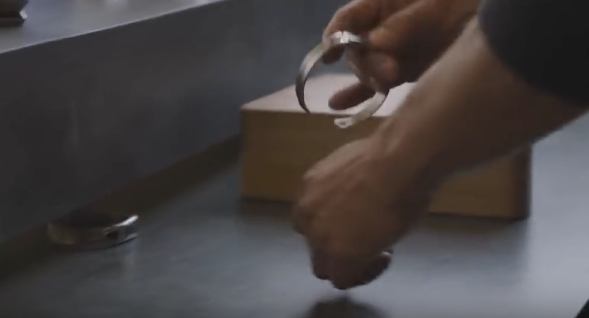 Any action done by Stark is imitated by Mark 42 if he connects with it. we see the Mark 42 in the workshop at the start of the film and after injecting himself we see him try to put on the suit. where the wiki says it imitates tony's actions we know it does more than that as Tony used it to fool Pepper that he was wearing the suit sitting in the lounge when really he was still in his workshop working on stuff and when they are sleeping the Mark 42 enters the room and looks as if it's about to attack Pepper before Tony takes up, commands it to power down and then does a sorta sword slash motion which causes it to fall into the individual components. [the Subcutaneous Implants is] the equivalent of what "Extremis" was in the comic storyline. he's trying to mask the pain. we see him saying "owe" when J.A.R.V.I.S is counting and J.A.R.V.I.S stopped counting at 47 and i think Tony does 2 more. so he injected himself like 49 times and they don't seem painless. While the “technical” in-universe answer is he’s injecting subcutaneous implants to control the Mark42 armor, Stark performs many technical tasks they don’t show us on screen. The entire Iron Man 3 storyline is about addiction - Tony is addicted to his legion of suits, all the baddies are addicted to Extremis... Showing Tony “shooting up”, basically, is a very direct filmmaker statement to that effect. He’d be doing the same thing if he were shooting up (you slap to get a vein, and lick for a very crude sterilization). See The Addiction Of Tony Stark, Why Won’t Anybody Help Him or any other number of analyses of the movie for more in-depth on this. The answer starts with the previous year's movie, The Avengers, in the famous "offer Loki a drink" scene (cued up). Note the bracelets he is clipping onto his wrists. Continue watching that clip. About 90 seconds later, Stark is thrown out a window by Loki. The "Mark VII" suit knocks over Loki in hot pursuit. The Mark VII locks onto the bracelets and wraps itself around Tony, just in time to brake his fall. The bracelets are essential to the suit latching on to him. Now, there's an obvious disadvantage, in that he has to wear those bracelets. Wouldn't implants be nicer? That is exactly what those are: an implanted version of the bracelets. I didn't see the movie since months but from memory he injects the tracking chips that define the anchor points of his mobile armor when he calls it remotely. So, you know, the crotch part doesn't anchor itself on his face by accident. I guess he licks/rubs it because the chip didn't align properly on the first try and he does this to put it in the right place. Not the answer you're looking for? Browse other questions tagged plot-explanation marvel-cinematic-universe iron-man-3 . Does Tony Stark urinate or poop in the Iron Man suit?